As I explained in my email, I am sending a message of outrage to New York Gov. 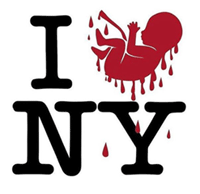 Andrew Cuomo and the state legislators who voted for a new abortion law that allows abortion all through pregnancy, strips the unborn from protection as crime victims and allows abortionists to let precious newborns die if they survive an abortion. I’m also inviting you to send a message of your own. When you fill out the form below, you’ll be letting me know that you are joining me in this effort. Express your outrage using the form below.